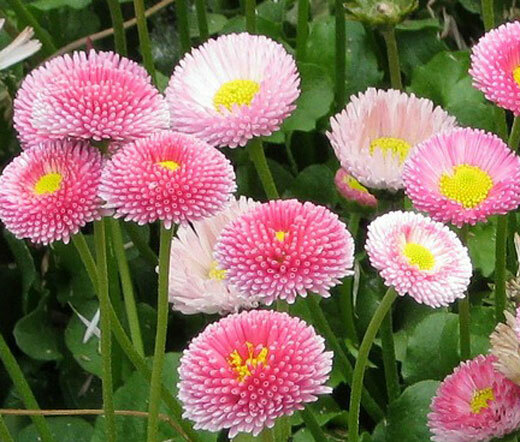 Daisy English Bellis Perennis is a herbaceous perennial native to Europe. For mass planting, Daisy English bulk seeds is a great way to start this attractive perennial that is also known as Common Daisy, Lawn Daisy and Bruisewort. Compact growing English Daisy features dark-green foliage and produces single or semi-double, white, pink, or mixed colors, daisy-like flowers with yellow disk florets. English Daisy blooms in spring and summer in warm areas, but it may bloom all season long in cool coastal climates. Daisy English is an outstanding border and flowering ground cover plant that is also a popular choice for alpine and rock gardens, mass and container plantings. Bellis Perennis seeds have to be just lightly pressed into the soil for the best germination. English Daisy grows very low to the ground and spreads quickly preferring to grow in fertile, moist, well-drained soil and full sun or partial shade.